this is the first time i have ever written a tutorial for something to do with sewing, so i’m sorry if it’s not the most proficient thing you’ve ever read! i love cardigans. they rule my world. however i’ve never made one! 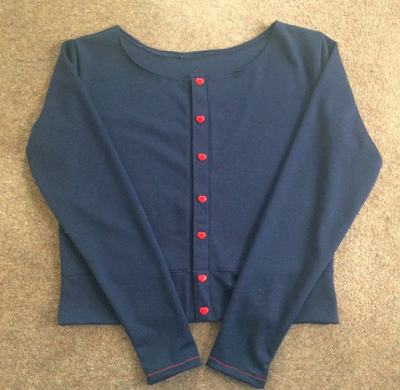 when the astoria jumper came out, i loved it and thought it would be ace if someone would do a tutorial on how to turn it into a nice little crop cardigan. but then i thought i would try it and see how it went. i made two versions, slightly different in construction/pattern pieces. the pictures i’ve used are a mixture from both of them so you know the fabric isn’t going from blue to grey then back again! so, there’s a choice on how you do it. i don’t really know which one is best, but the way you pick does depend on the pattern pieces you have to alter, or if you have to make a new piece! variation one – no separate button bands. for this version, you need to change the front piece, and the waistband. take your bodice piece, and lie it on top of some pattern paper (or whatever you’ve got to hand). 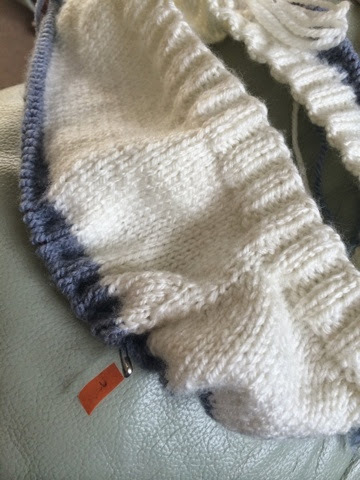 if you were making the jumper, you would cut this piece on the fold, but you don’t need to for the cardigan because we want two front pieces. you need to decide how wide you want your button band. i went for about an inch i think. 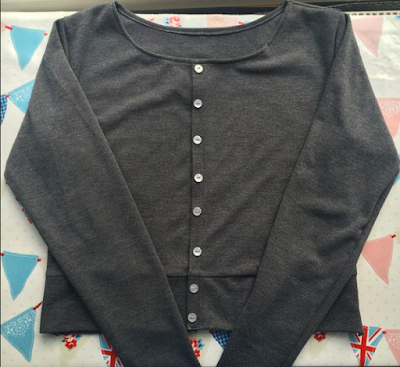 cut two strips of interfacing the same width as your button band. i used fusible web interfacing so it kept both sides stuck down. draw around your front bodice, leaving off the straight line where you would normally place on the fold. this is where the button band will be formed. extend the line by double the width you want your button band to be (because it folds under), then add on 3/8th inch for the seam allowance. cut two of these out of your chosen fabric. to modify the waistband, you need fold it in half lengthways. draw around this too, leaving off the straight line on the fold. add the same amount of width and seam allowance as you did for the bodice. you need to cut two of these, plus one the same as the original full unmodified one. sew the shoulder seams together with the right sides facing, and attach the sleeves. now you’re going to attach the waistband to the bodice, but don’t fold it in half – you only want to sew one edge to the bodice. attach the interfacing down the bodice and over the waistband. the fold goes on the inside of the garment so it’s hidden inside. iron it in place, and the bit you’ve just made will be the button band. top stitch it to make it look more like a separate button band. 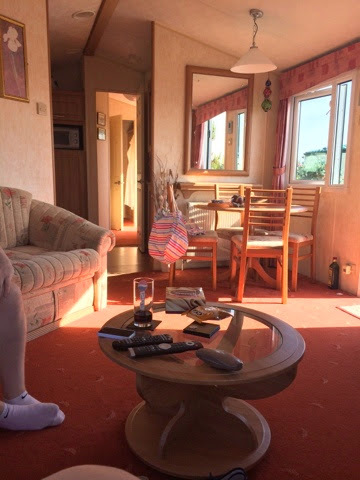 maybe i should call this the cheating way! if your fabric unravels, you’ll want to finish the edge of your button band before you sew it down. 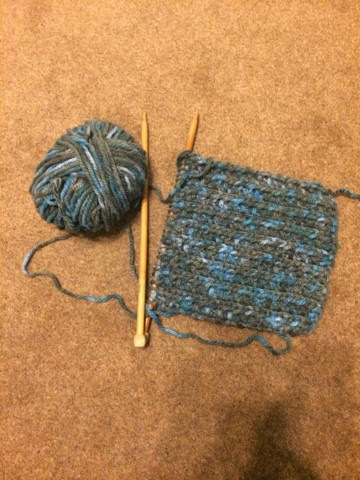 i used a ponte knit so didn’t bother finishing mine. sew the side seams and the arms. now you’re going to fold up the rest of your waistband, and pin it in place. top stitch it from the front so you catch the inside, and get a decorative line of stitching at the same time. i tried to make a neck band but it just looked horrible, so just fold it under and sew around. i folded about 3/8th of an inch under. then do your buttons and button holes, and finish off the sleeve cuffs, and you’re done! variation 2: with a separate “real” button band. the pattern pieces are adjusted slightly differently on this version. trace the front bodice piece, but instead of adding the width of your button band as above, you only need to add 3/8th inch so you’ve got something to sew the button band to. the waistband needs to be separated into two parts, again, like the first version, but only add the 3/8th inch again for the seam allowance. you need to make a pattern piece for your button band now. do this by lying your bodice piece and waistband piece together (as you would when the garment is constructed) on some pattern paper. mark the top and bottom to get the length. add about 3/8th of an inch on the top. although there will be some seam allowance included (because of laying the waistband and bodice out; they already have a bit of seam allowance where you join them together) i found it’s best to add a bit more so you can comfortably fold the neck band down. you don’t need to worry so much about it overhanging at the bottom, because the waistband gets folded up and it all gets tucked out of sight. once you have decided on the width you want, double it because the band will get folded in half. add a 3/8th seam allowance all the way around. cut some interfacing for your button band. it’s very similar to the version above so i’m sorry for the repetition. i’m not repeating all the pictures, haha. sew the shoulder seams and sleeves as per the astoria instructions. attach the waistband in it’s unfolded form, so you’re just sewing one edge of the waistband to the bodice. sew the side seams and the sleeves. next, fix your interfacing to the button band, folding it in half. match the raw edge of the button band and the bodice edge, and sew together. top stitch down to keep your seam lying flat. on to the neckline. fold it over about 3/8th of a inch then stitch all the way round. do your button holes and sew the buttons on, then you’re good to go! so there you have it, how i made my astoria cardigans! i chose to lower the neckline on both of mine so there’s something else you can try too. if there’s something that doesn’t make sense, or i haven’t explained it properly, let me know and i’ll sort it out!